One of the wonderful things about the Beadalong is seeing all of the different colourways. It’s unusual to be exposed to so many interpretations of the same design so quickly, and it’s been fascinating looking at the different approaches we all take. Some of us chuck as many colours as possible in, others focus on their favourite colour and use different tones, and others pop a single colour as a highlight with neutrals. For me, as a bright beader, it’s been lovely seeing some really outrageous combinations, but I’ve also become drawn to some of the more sophisticated palettes. I think my next delica project might be done in matte steel, with some antique gold – classic with a twist, and perhaps more wearable than lime, orange, scarlet and fuchsia…..? Rivolis – Chinese ‘Volcano’ from Southampton Bead Shop. I don’t normally buy cheaper rivolis but the colour on these is unique. They are a bit fat, so you need to adapt the pattern (one extra row of delicas did it here), and I don’t use them for my own patterns and materials packs because of that. Pearls/Rounds – 2mm Scarlet Czech Rondelles. Not a clue where they came from!! And as for the next step, I’d guess I still need another 18g or so of delicas, so I may have to make up a mix from my stash (I’m only using stash beads for this and I won’t have enough in a single colour by a long way), or come up with a way to use multiple colours once I know what we’re doing. Nice, although my tension on the surround has a tendency to distort the bezel, and I prefer the look of the back set of petals to the front…. …..and I cheated a bit too. I wanted the second set to be seen in the middle of the gap of the first set (so offset by two bezel beads), but going out of the next row of peyote was going to leave them only partially offset (1 bezel bead). However, as I had used non-Swarovski rivolis, which have a thick band around the middle (rather than a neat pointy edge), I had already added an extra row of delicas to the bezel, so I was able to bead the second set two rows back from the first set and acheive the tidy offset. Domestic commitments yesterday mean I am no longer working a day ahead! So here is day 4, just in time. This one was quite fiddly and took a while to complete, but I like the results. As a set they are looking rather splendid. I have also done half of day 5, which went together more quickly, but want to check placement of the second half, so will wait for Jean to post her picture tomorrow……….and it is way past my bedtime anyway! This is my favourite design so far to bead, with an unusual and clever thread path. Although I think the matte neon purple with duracoat zest may be a colour combination too far………. Lovely sparkly petals very cleverly designed. Yummy, and less fiddly than day 1 (I find fringe a little trying). 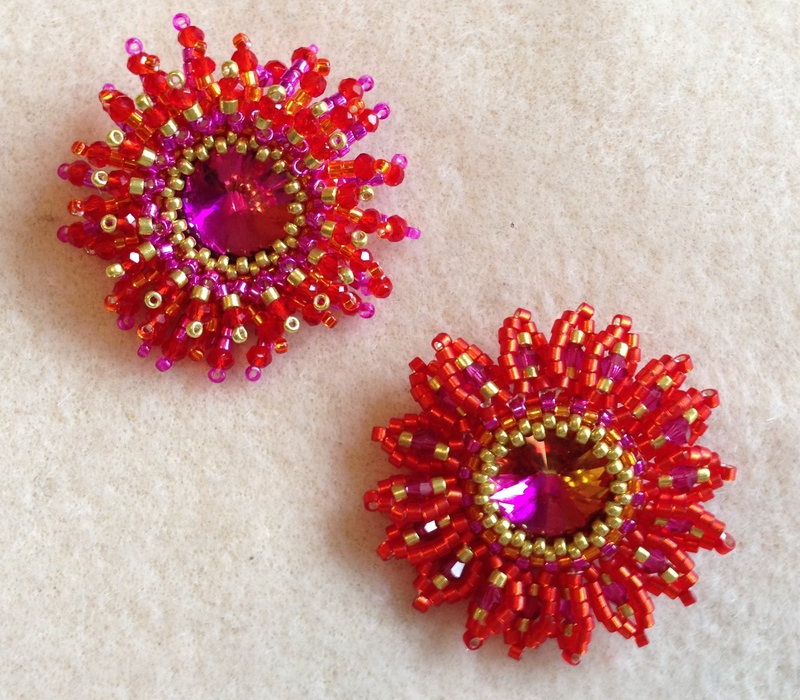 Secret Beadalong Day 1 – Fringetastic! 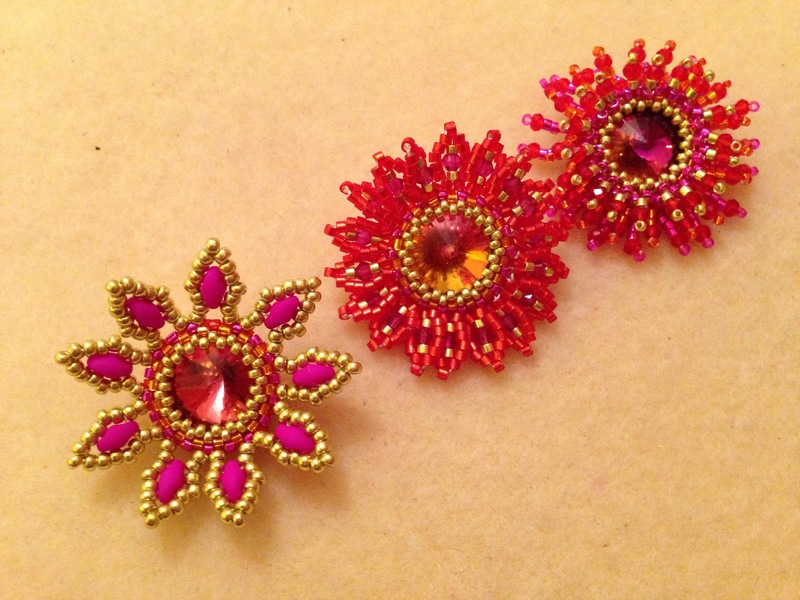 Author theindecisivebeaderPosted on July 25, 2015 July 25, 2015 Format ImageCategories BeadworkTags beading, beads, beadweaving, beadwork, beadwoven, jean power, national beading week, secret beadalong1 Comment on Secret Beadalong Day 1 – Fringetastic! The first instalment of my new ‘Beading Beaded Beads’ project, in which I will bead lots of beaded beads and tell you all about it. Beaded Bead 1 was not good – I rather suspect this was my fault rather than the designer’s, so I’ll re-do it and tell you about it later. Beaded Bead 2 is from a free tutorial by BeadTurtle. 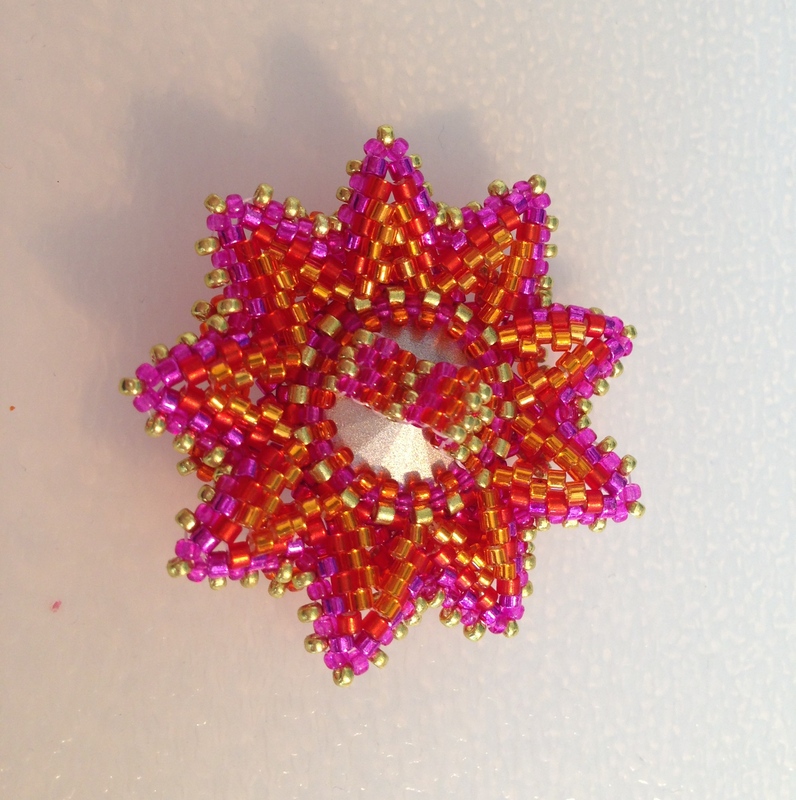 It’s a nice simple tutorial using one of the standard techniques for building a dodecahedron – groups of 3 larger beads linked through groups of 5 smaller beads, and I’m sure some similar ones will appear later in this project. She specifies size 10 seeds, but I don’t have any, and as this project is supposed to be a bit of a stash buster I had to use what I had already. I’ve tried the tutorial before with size 11s and it didn’t work, so I went for size 8 seeds and tweaked the embellishment. Don’t worry too much about tension as the final embellishment of the seed bead groups of five tensions and stiffens the ball (up to that point it was alarmingly floppy). Where she adds the yellow centre to the groups of size 10 seeds, I simply added an 11 between each of my 8s. This was a lovely quick and comfortable project, and has given me a good base technique which I will use again and embellish. Although I think these were my only 6mm rounds so there won’t be another one with rounds in this project – it would work equally well with any type of larger bead, and I’ve seen similar techniques applied to fire polisheds, crystals and even spikes. For my next beaded bead I’m going to try an even simpler version, which omits the smaller groups of 5 and just goes for the triangles of larger beads – hopefully soon! 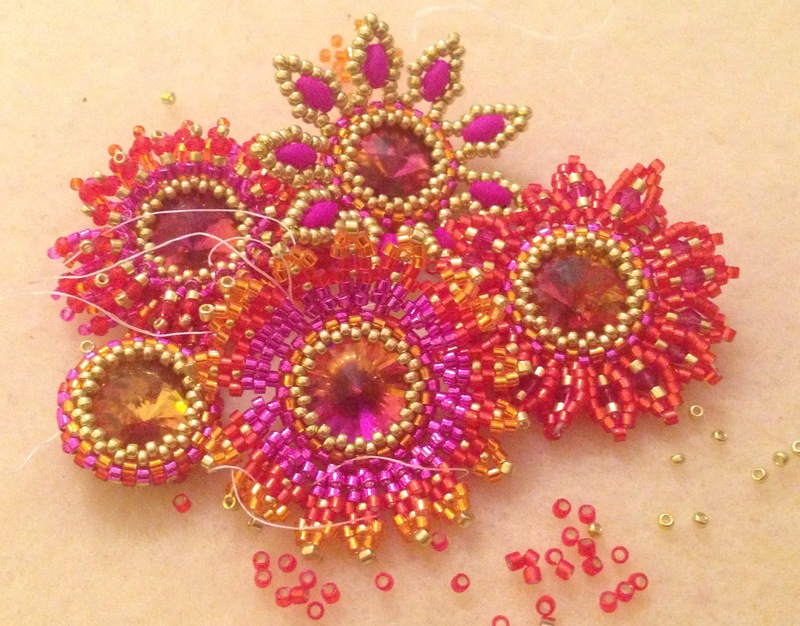 And then there is Beaded Bead 1 to try again………….